Nori is dressed in her usual clothing, looking very innocent. 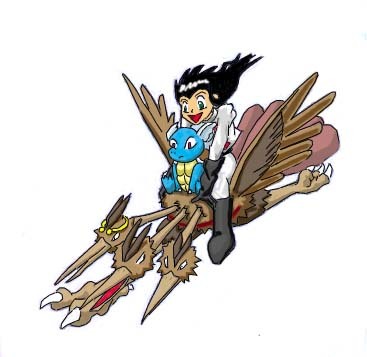 Her Meowth is enjoying a ride on top of her head! 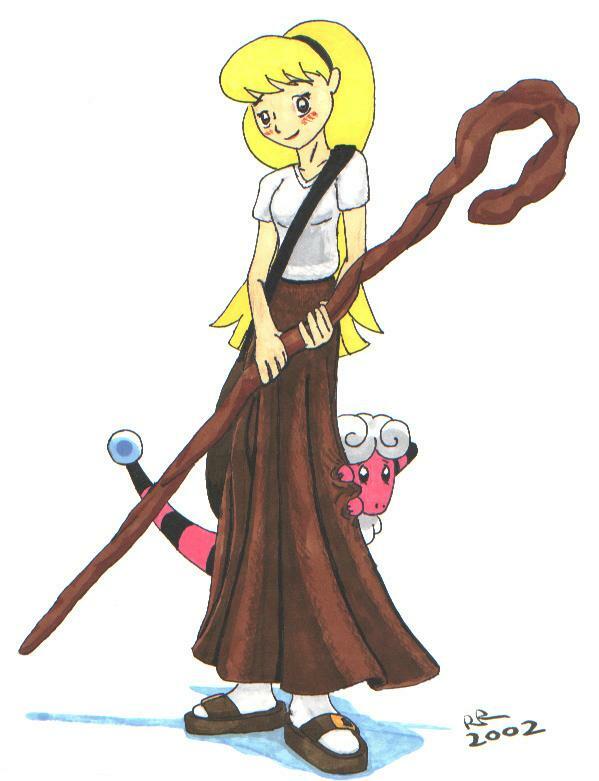 This is a depiction of when Nori infiltrated the Rocket base in Saffron. 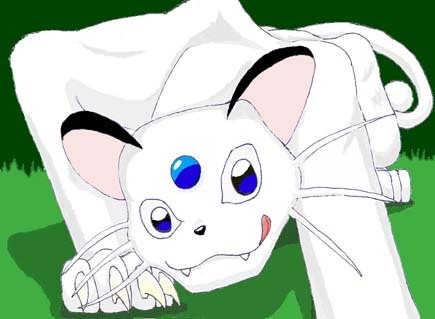 Nori is featured with the Meowth that used to manipulate her. Renee is being followed by Bagel, her own Meowth. 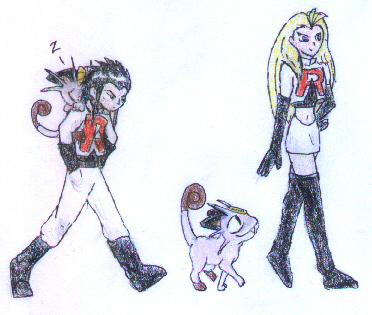 Nori received a mission from a confused Team Rocket member to capture a very special Persian named Blizzard. Sabrina felt uneasy about Nori's presence in Saffron and sent her all the way to the Seafoam Islands, where she encountered the pure white feline. 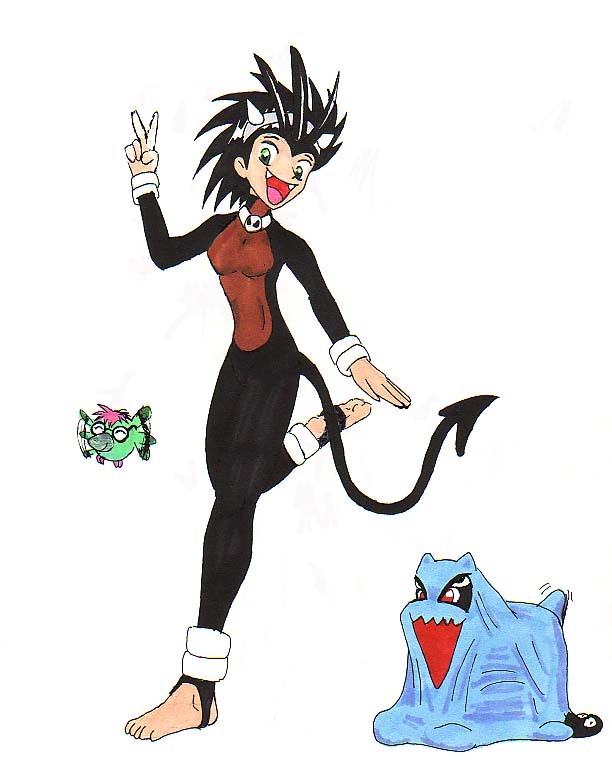 This drawing shows Nori raising the "Rocket Ball" that the Team Rocket member gave her up high, and her Magmar stands alongside her. Blizzard is simply basking in the sunlight pouring in! This guy's a Unihorn, one of the Pokémon native to the planet Tie'nek. In the grand tradition of the jackelope, I've simply taken an animal that already exists, grafted a horn onto the top of its head, and called it a day. 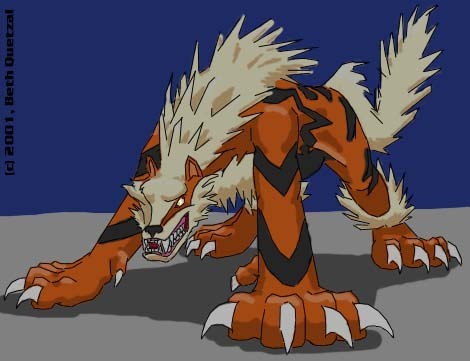 This made-up Pokemon came from an ongoing PW! NC (non-continuity) thread. 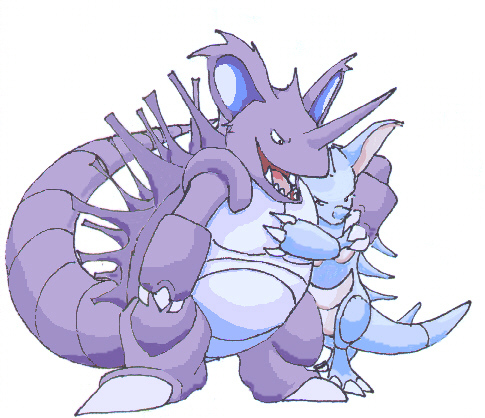 Upon seeing Bandraptor's rendition of his megalomaniac Nidoking embracing Jeanette's leaner-than-usual Nidoqueen, Karnivax exclaimed, "Awww...ain't it cooooote? 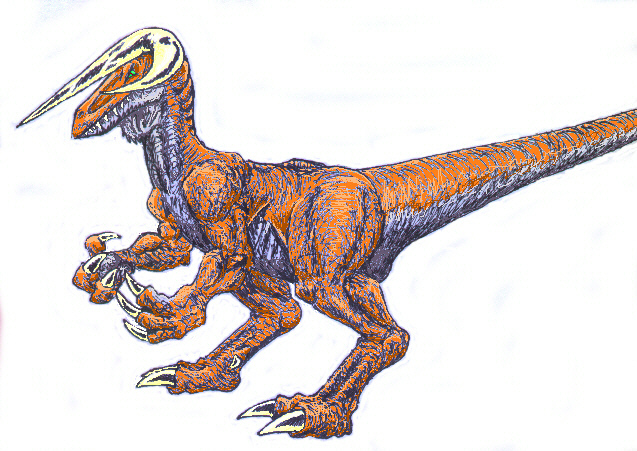 ^_^"
This is a picture of Karnivax's character, Protopticon; a fusion of the evil Ditto Proteus and cyber raptor Panopticon. Blizzard, my Persian character from PokéWars. A slightly newer picture of Nori. Here she's paired with nihilistic Wartortle Rubix; and hyper-aggressive Dodrio Cerberus, who's about to throw her from its back. 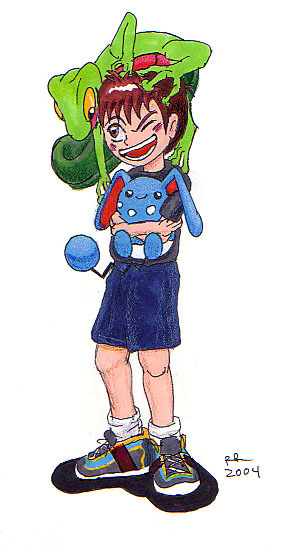 Oh yeah, a good shot of Nori and her Pokémon. They know they're being sketched, which is why they're all posing. Gurion the Arcaninen, drawn back when I was doing a PW! spoof of Whitley Strieber's The Wolfen. Gurion is smarter than the average mutt, but in the PW! world, where every other animal talks and/or plays lead guitar for a rock band, this guy's comparatively pretty dense. 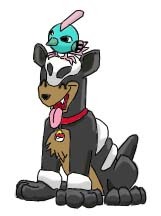 He'll eventually be captured by Nori, tamed, and studded out to a Houndoom trainer...it's a dog's life. 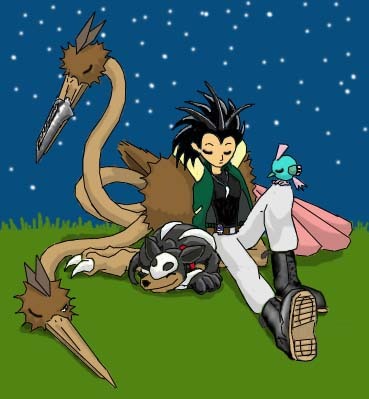 Anubis didn't turn out quite as cute as I would've liked in the previous pic, so here he is again, along with Set the Natu. 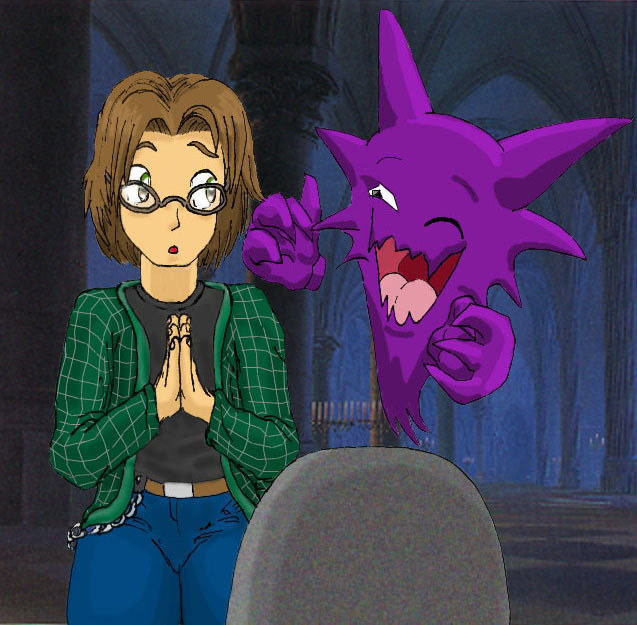 A picture of NewHaights's character, Andrew O'Reilly. He's looking a bit baffled here, after running into the ghost of one of his grandpa's old team mates. And that background was lifted, in case it isn't painfully obvious. Having found a potential recruit in Andrew O'Reily, Andy Renev is happily extolling the virtues of his pro-Magnemite organization, the Bomb Ball Bashers! Nori and Enimuram are just sighing, they've heard his spiel before. 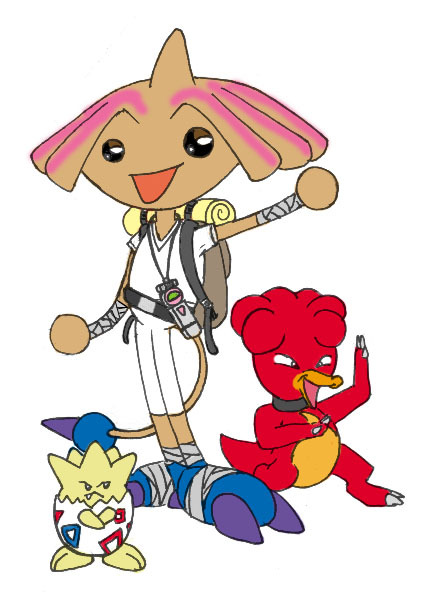 This picture features Cappie the Hitmontop with Gar, her Magby, and Togepy, her Togepi. Sarah the shy shepherdess poses for a portrait with Barbie, her paranoid Flaaffy, who's hiding behind her skirt. 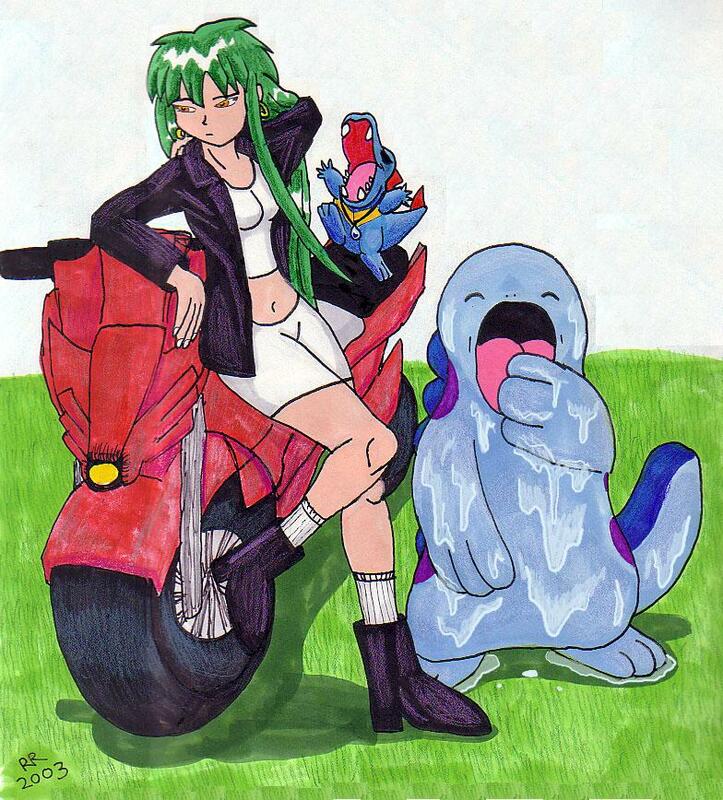 Sarah's rival, biker girl Roxie. Roxie's Totodile, Aquarius, is wearing his trademark Mystic Water pendant; and Shaft, the overly slimy Quagsire, is yawning in boredom. 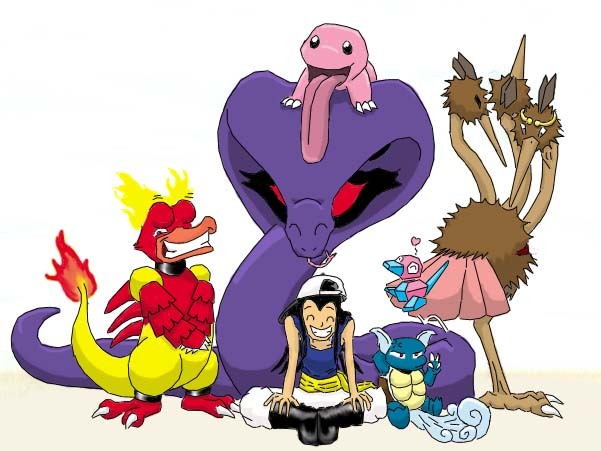 It's the Brotherhood of Evil Pokémon (self proclaimed)! 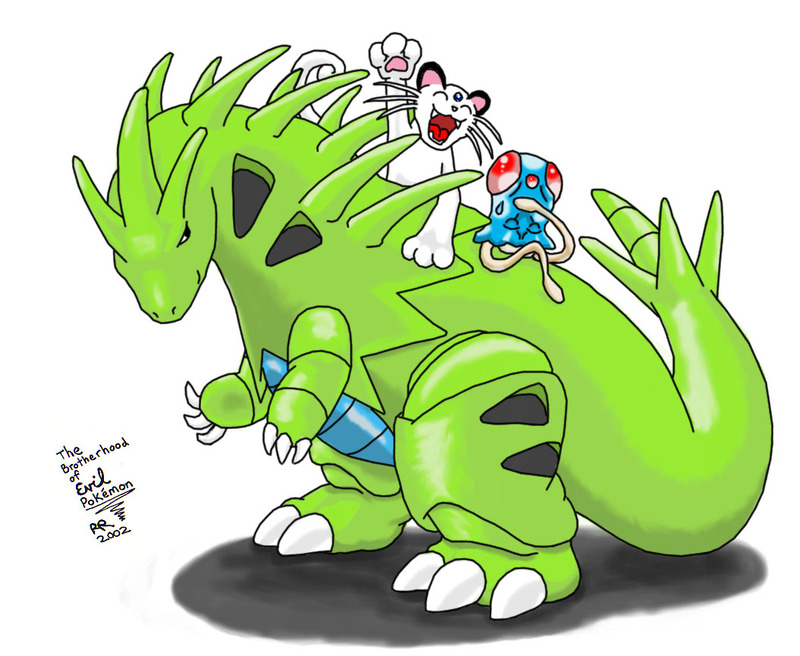 Members are Blizzard the Persian, Sting the Tentacool, and Avalanche the Tyranitar. 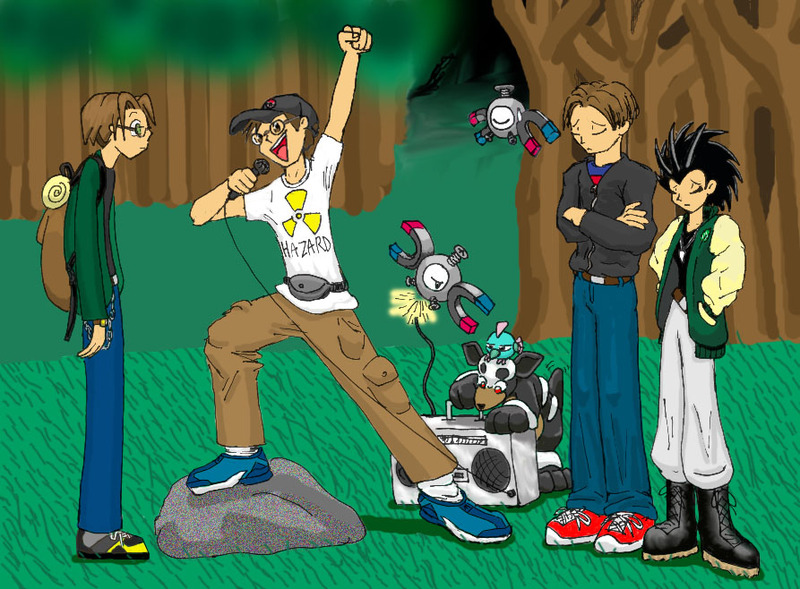 It's a PokeWars Halloween pic! Here's Nori as a Houndoom, Anubis as a Wobbuffet, and Set as Harry Potter. 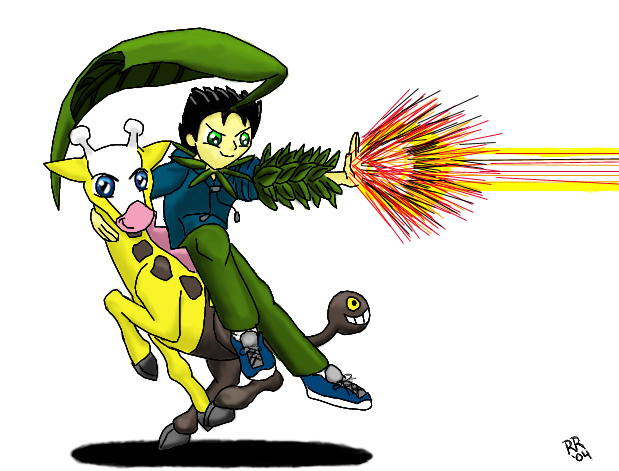 Here's Bob Raiser--Pokemon Breeder extraordinaire and Bayleef hybrid--riding on the back of his Girafarig, Raffy! He's firing a Solar Beam at an unknown pursuer, probably a member of Team Magma who's trying to turn him into a lab specimen. Sapphire, aka Grey, is a Team Rocket executive who's working undercover in the guise of a rookie Pokemon Trainer. In the first picture, he's displaying a happy smile for all to see! In the second picture, he's expressing what he really thinks about his current assignment. Nori's on the S.S. 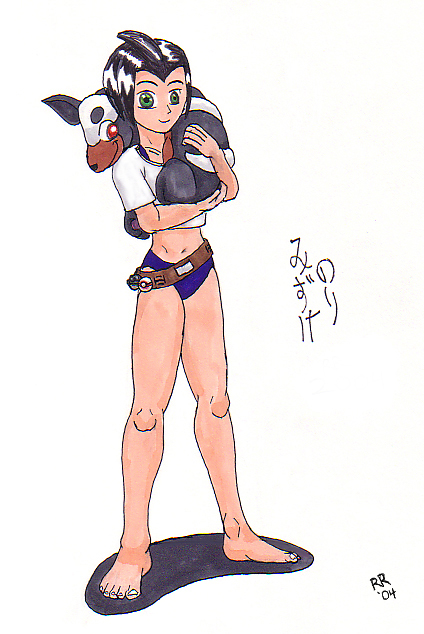 Tidal, en route to Hoenn, so naturally she's wearing a swimsuit. She has a tight hold on Anubis, who wants to explore the ship by himself! 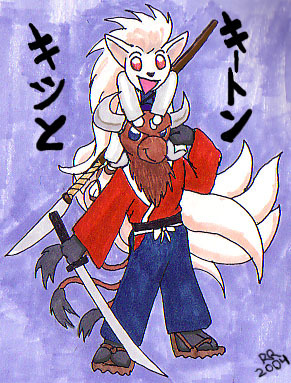 Kitsu and Keaton Nidon in chibi form! 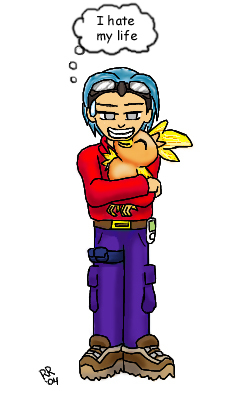 Here's a picture of Jeff Raiser holding Mary the Azumarill in his arms. Bob the Treecko is perched on his head.